We are arranging, what turned into a CycloCross Weekend at the GAP Glencullen. Race on the 11th, and a training day on the 10th. We need your help in making this a success. If you haven't contributed to the High-Five Pledge, now is your chance, I would love to see some new faces. Orla Hendron is organising a CX Training Session, lead by Andy Layhe and Beth McCluskey. I'm sure that it's Orwell Members Only. 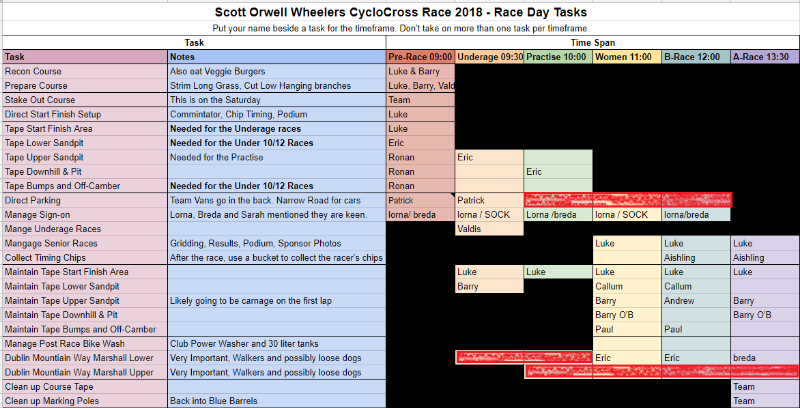 Sign-up Link: Scott Orwell Wheelers CX Training Day . Help Needed #1: Also on the 10th, we need your help in marking out the course with poles. We are arranging the open Race to take place. Help Needed #2: We need help taping up the course, and repairing damaged tape during the race. Help at Sign-on is always appreciated. How to help I'll setup a WhatsApp group for the weekend and post the link here, join the group if you want to help out. In the meantime, please come to the Bike7 Charlesland CX Race on Saturday evening 27th October , and see what this CX malarkey is all about. Last edit: 5 months 1 week ago by Louise Keane. Hi all, Helmet nervously grasped in Many Hands to make light work, as I approach thee. Please click to join, if you can help out to Stake the course on the 10th, or Tape, Re-Tape and/or Marshall on the 11th. I also have a Spreadsheet listing the tasks, it's open to everyone to edit, so I'll hide it, so only logged in members can view it. It's also linked in the WhatsApp group chat's description. I'm happy to help on Sunday morning.I would need to be finished by 10.30. I don't want to keep anyone for more than an hour, ideally. On the spreadsheet above I have the tasks broken down by hour. The most important thing is that we have the U10 and U12 parts of the course (Start/Finish, Lower Sandpit, Camber) taped up by 09:20, and the rest of the course by 10:10. We'll need a marshal for the Dublin Mountain Way for the U10/12 Race 09:30 -> 09:50. I am not around Sunday but around for at least first half of Saturday. We don't have a planed start time devised for Saturday yet, as we want to align the delivery of Portaloos and Barriers with us being there, but we'll put it in the WhatsApp Group, if you join. Club Members, we need your help for the CX Race this Sunday, please. Just an hour of your time to fill the remaining slots (in red crayon on the image). Marshaling the Dublin Mountains way (you'll see lots of the race) and Directing Traffic. Last edit: 5 months 2 weeks ago by Luke GJ Potter. Can help on Sunday Luke, just lemme know where you want me. No commitments so can cover whatever gaps. PS: The spreadsheet link is hidden from the general public but the Whatsapp isnt. As an anti spam precaution it can be good to hide those too. Hi Luke I can help out on the Sunday, I put my name down for the 10 and 11 marshalling slots in the spreadsheet. Last edit: 5 months 2 weeks ago by Donal Arundel. Thanks Simon, Donal and VP Flanagan, it's really coming together. Only just Directing the Parking for the hour slots 10:00 -> 11:00 -> 12:00 -> 13:00. GAP will give us a field to use for attendees. The existing carparks are reserved for GAP Patrons and Dublin Mountain Way Walkers. It's only until 13:00, I can't imagine anyone rocking up after 12:45 though. I'm not 100% sure of Patrick's leaving time. And The Upper Sandpit Dublin Mountain Way Crossing for 12:00 -> 13:00 -> 13:30 -> 14:30. This will be a great viewing point for the race. It's just to stop Walkers crossing the course when there are riders near. I've been up there the last two Saturdays and there are lots of nice dogs that you can pet, if that's your thing. I’m able to help Sunday. to move me around or need me earlier. Big thanks to Luke and Co. for organising a great event. Lovely to see such a big cohort of youths participating. Huge thanks to everybody who turned out to help today, especially those non CX’rs. We got really decent numbers and feedback seems to be very positive. A special thank you to Luke, who took control of the organization and put in a huge amount of work over the last month, without which the event would never have taken place. I'd also like to echo Paul in saying a massive thank you to all of you that gave up your Sunday to come out and help make yesterdays race happen. Hopefully some might even catch the CX bug. Don't let the haunted looking riders gasping for air put you off, you just watched a race on one of the toughest courses on the circuit. 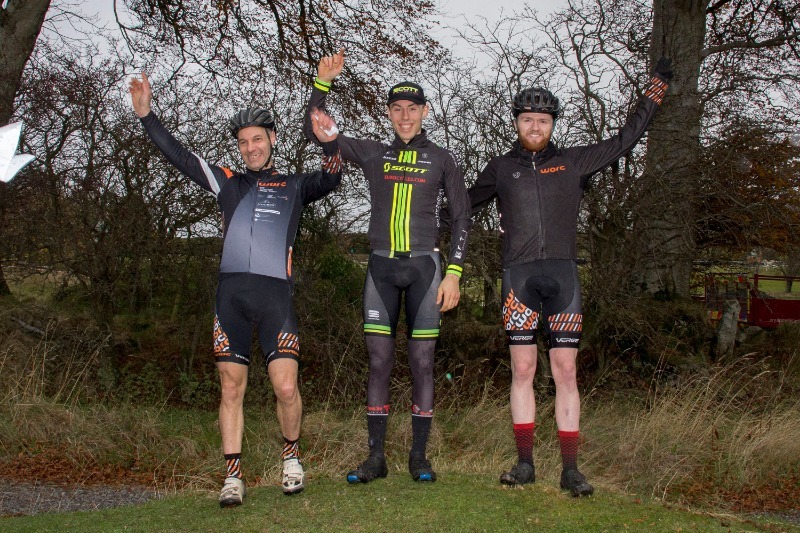 To the zen master of calm Luke, congratulations on organising and running the clubs first open cyclocross race. Hopefully you'll get to relax now and put your feet up. Massive Thanks to everyone who helped out on this race. It was a tough six weeks making the contacts and putting processes in place. None of us had been involved with running a CI Event before, so we went from zero to 100 real quick. I really appreciate everyone who helped out on the day. Most of whom hadn't even seen "one cyclocross" before, but they all learned quick. 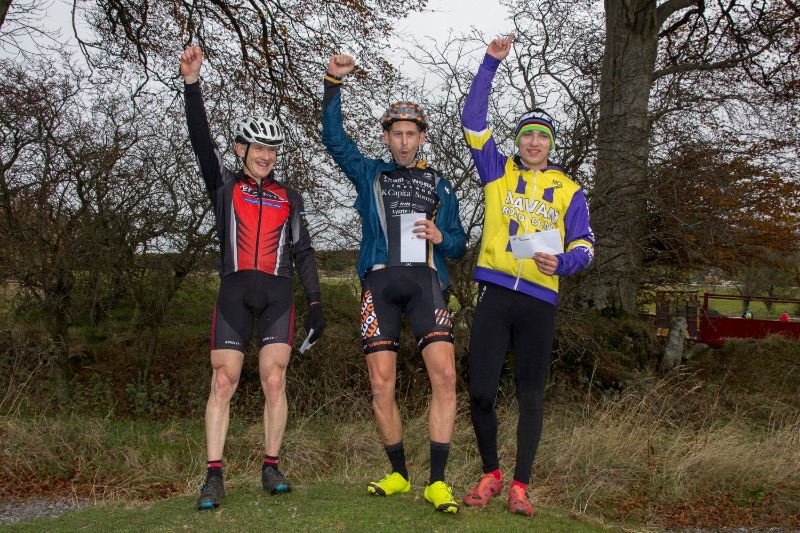 Special Mention to Andrew Ryan (Two-Time Club Youth CX Champ), who gave us his whole day. He taped up the course at 08:30 and tore it down at 14:40. I asked for "new faces" to help out and we got two. Vice-President Flanagan and Simon were the only two I didn't know. George helped out with the carpark much earlier than needed and Simon setup the course and took lots of photos. Just the Lessons Learned Report to right now, so I don't forget to improve on for next year. Highlight of the day was the three U16s battling it out, closely followed by Aine's brownies.